KADENA MARINA, Japan (Jan. 31, 2009) Was able to get to the marina for about two hours today to continue the starboardside net installation. 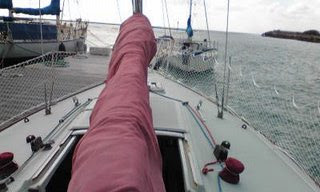 I checked Buoy Weather and Kadena Weather earlier and decided that I would not sail Scarlette on Sunday, (Feb. 1, 2009) because of weather warnings of heavy winds and surf. As I said previously, the installation is a slow process as I'm wrapping a rope through every other hole in the net to keep it strong and so it doesn't look too hokey. If I try to go to fast, the rope I'm using a three-strand twisted rope, start to untwist. I've tried a couple of times to try to find a faster way to do this. 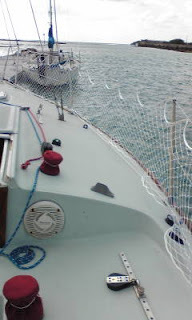 The portside net installation took about 5 and a half hours. 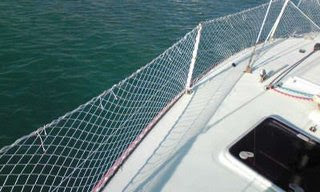 So far the starboardside net install has take about three hours. The owner of the Albatross a 42-foot Tayana yacht walked by and asked, "You got kids?" "Yep," I answered to his assumption behind the reasoning for putting nets on what is essentially a racing boat. Plan is to try to finish the net job in hour spats after work this week. 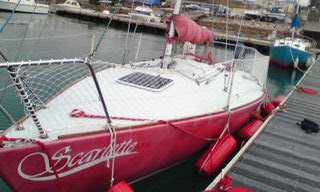 I can't really sail Scarlette until the net installation is done and I want to get out on the water next weekend. Especially, since I couldn't this weekend. I'll still have more work to do on the nets after they're installed but the major work is getting the starboard side netting installed. Then I'll worry about the small details. Got about halfway on Sat. after 2 hrs before going home. 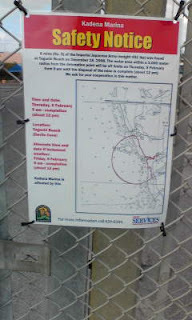 Sign at marina says it all. KADENA MARINA, Japan (Jan. 30, 2009) Beat feet right after work and spent about an hour aboard Scarlette prepping the starboardside for net installation. The process is tedious to say the least. 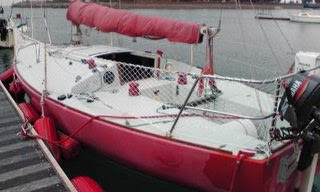 I first had to string up a line across the bottom of the stanshions (the poles on the deck) that hold up the life lines. Then I used small string like before to keep the net in place. I was able to get the entire net placed on the lifelines and had to leave. It was pretty wind but hoped that it would hold until I could get back again to at least start the full installation. KADENA MARINA (Jan. 19, 2009) -- Spent most of today adding safety nets to the port side lifelines with Kai. He used the Swiss Army knife to cut set up strings, so I could attach the net, then I attached it later with stronger rope. As a boy this was a pretty cool thing to do. 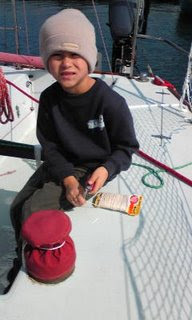 Getting to use a knife on a boat -- only thing we didn't have was pirate hats, eye patches or a scar on our face. Had a fun time just spending time with Kai by ourselves. 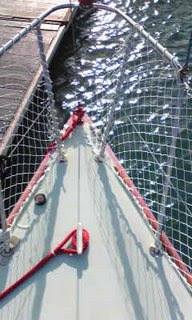 The newly installed net looking from the bow. 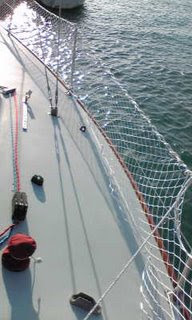 The newly installed net looking from the stern. This took us about 5 hours -- we broke for lunch at Burger King (got take out and ate it back at the marina on a picnic table overlooking the South China Sea) -- to do because I didn't want the net to look like some hoopdee thing. When we got it all done, Kai decided he wanted to "safety" test it so he slid down the deck a little to see if the net would catch him. 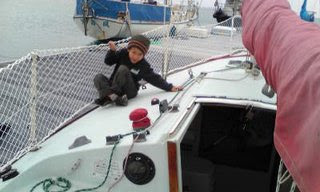 Still will have to drill some holes on the toe rails to completely install the net to make it so one of the kids can't slip through -- not that any of them have as of yet -- but don't want to take any chances especially when it's just me and Kai on the boat. Not sure when I'll get the chance to do the starboard side. Hopefully, next Saturday. Really wanted to sail today, but knew these lines had to go up and it took forever to put on.